We can service or provide parts for your ETC Unison architectural control system. 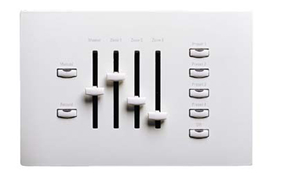 Unison fader stations provide comprehensive zone and preset control for architectural lighting applications. These elegant fader stations are available in a wide variety of configurations and colors, as well as custom options. ETC Unison Touchscreen Faceplate. Color is ivory. ETC part #7081A2801-1 Limited quantity remaining.